Rose otto is one of the most powerful anti-aging essential oils due to its ability to combat free radicals and stimulate the production of collagen. It also has a stimulating and toning action on the capillaries that helps encourage and improve micro-circulation, making it appear glowing, softer and more youthful. 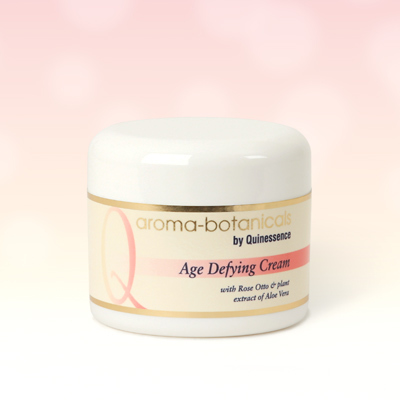 Voted outright winner of 'Best Day Cream' in the Natural Health & Beauty Awards 2008, the panel of beauty experts described Aroma-botanicals Age Defying Cream as;- 'An excellent value-for-money daily moisturiser. Light and delicately scented it combines extracts of organic English Lavender and Rose Otto oils, together with Shea Butter and Aloe Vera to help plump up the skin and protect against free radical damage'. Aqua, Caprylic/Capric Triglyceride, Aloe barbadensis, Glyceryl Stearate, Butyrospermum parkii, Stearic Acid, Glycerin, Ceteareth-20, Simmondsia Chinensis, Rosa damascena, Lavandula angustifolia, Carbomer, Cetearyl Alcohol, Gluconolactone, Sodium benzoate, Calcium gluconate.